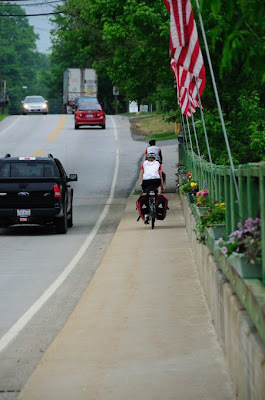 Thanks again to Doug for the photos! 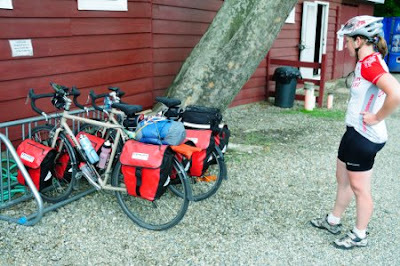 Our favorite avid blogger and blog reader Mars Girl asks, "How does one go about preparing for a long bike trip like this?" Good question, and we've got some good answers. Several of the CC staff have some experience at this sort of thing, so stop by our stores and they'd be glad to chat with you about it. 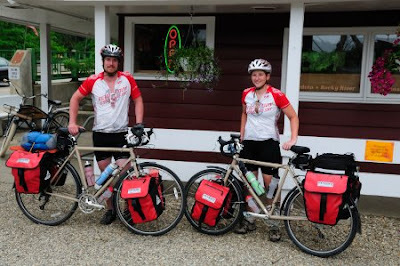 A great online place to start is the Adventure Cycling Association's How-To Department at: http://adventurecycling.org/features/howto.cfm They've got great articles for the beginning cyclo-tourist, covering everything from training and packing, to routes and maps. 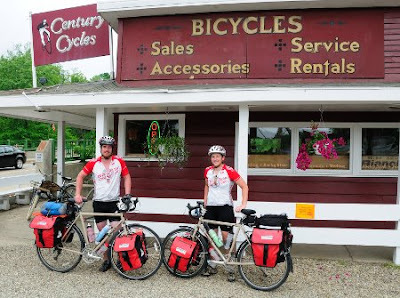 Speaking of long-distance riding, two of the CC staff are competing in tomorrow's Mohican 100 Mountain Bike Race. Brent from the Peninsula store (on his Surly Karate Monkey) and John from the Medina store (on his Salsa El Mariachi) will be riding the grueling 100-kilometer course! Good luck to Brent and John in the race, and good luck to Kelly and Chance on their cross-country journey! I love that truckaccino. I sure wish the Cross Check came in that color! I almost want to get a Long Haul Trucker just so that I can get that color. Not real thrilled by the Beef Gravy Brown. GOOD LUCK BRENT AND JOHN!! Whoo-wee! And Vince from ABC who I believe is also doing that race. Yeah, we've been lovin' the Truckaccino, too. The Beef Gravy Brown Cross-Check is not as bad as you think; it looks better in person than in photos. We just got one in for stock (54cm); it's in the Medina store at the moment.